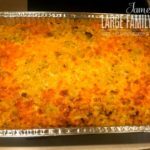 This new BIG Beef Macaroni and Cheese freezer meal is an even bigger variation of my original Homemade Baked Macaroni and Cheese. My original recipe was for about three 9×13 pans full. Well, this “super mega” version is enough for three 19 x 11 deep dish pans! I wanted to try these 19 x 11 deep dish pans I picked up during my last large family Costco haul. I had a few concerns about doing large family recipes in these size pans. After experimenting I found they did work out well overall. In order to get them to cook all the way through I needed to set them out from the freezer into the refrigerator at least 24 hours in advance, so be aware of that if you tackle cooking in this much bigger size. I also had to place these large deep-dish pans on my middle oven rack and check-in on them a few more time than I normally would. Also be aware that these big deep dish pans take up more freezer room. I had space for it since my freezer meal stash was nearly zero. If you’re tight on freezer space you may want to make the 9 x13 variations. Here’s my affiliate link to see a big list of freezer meal pans on Amazon! 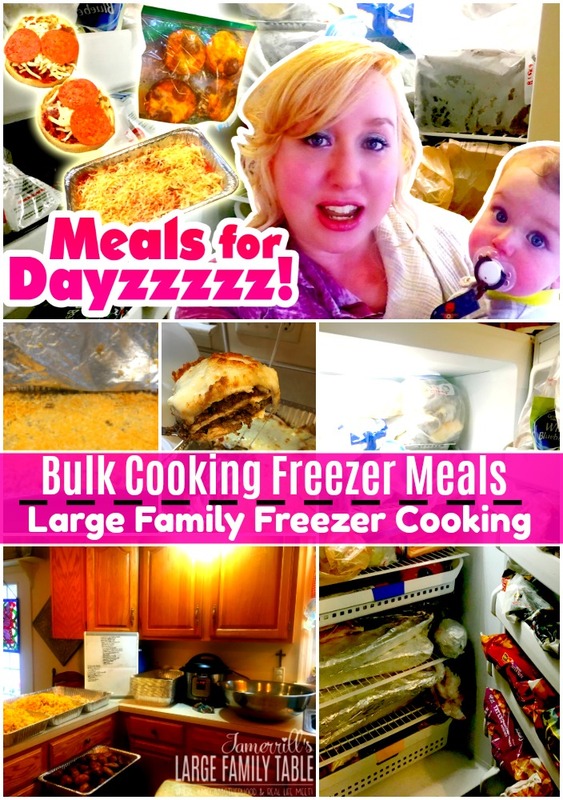 You can also see my personal large family “must have” freezer cooking supply list here. Below is a picture of how my Macaroni and Cheese freezer meal looked after it was defrosted for 24 hours and before it went into the oven. The large family recipe below is for three 19 x 11 deep dish pans. If you want to only use 9 x 13 pans for this Macaroni and Cheese freezer meal you should end up with about 8 pans full. Anyway you choose to dish it out, how lovely to have homemade baked Macaroni and Cheese in the freezer and ready to go! Now below is how this big deep dish Macaroni and Cheese freezer meal looks hot out of the oven! 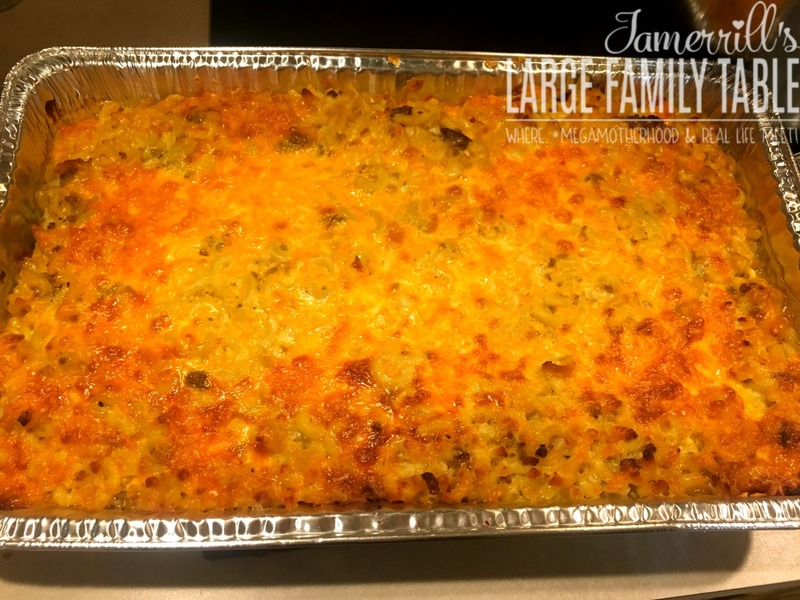 Our large family gobbled up this baked beef macaroni and cheese freezer meal. One of the 19 x 11 deep dish pans is 2-3 meals for our large family of ten. Dish out this same volume recipe into the more standard size 9 x 13 pans and you should yield about 8 pans full. This recipe is good for about 3 months or so in the freezer, so cook ahead for when real life happens! 96 oz cooked and drained elbow macaroni (this would be similar to three of these 32 oz boxes of elbow macaroni from Walmart). Cook, crumble and drain 10 lbs of ground beef. Pour 2 cups flour into melted butter and stir together until flour is thoroughly moist. This happens quickly so stir, stir, stir! Whisk in 16 cups of milk (yes, an entire gallon!). Stir constantly for several minutes until boiling. This is where having a strong-armed teen can come in handy. Using a metal or wooden spoon, stir in 16 cups of cheese until completely melted. This takes about 2-3 minutes of additional stirring. Remove from heat when thoroughly melted. Pour in 96 oz of cooked and drained elbow macaroni and the 10 lbs of precooked, drained, and crumbled ground beef into your large stock pot of homemade cheese sauce. Stir gently, so you don’t mash your noodles. Spray your baking dishes with non-stick spray. Fill each dish 3/4 of the way full with Baked Mac and Cheese mixture. Top with remaining shredded cheese if you’d like. I didn’t have any more on hand and it still turned out nice and bubbly. If using the 19 x 11 large deep dish pans fill three about 3/4 of the way full with your beef mac and cheese mixture. Top each pan with about two additional cups of shredded cheese. 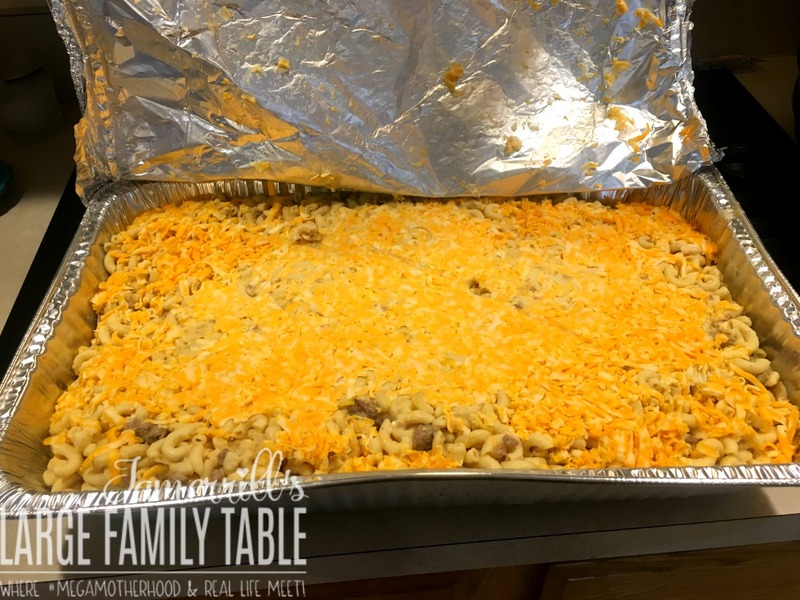 If using 9 x 13 pans fill up to 8 pans 3/4 of the way full with your beef mac and cheese mixture. Top each pan with remaining shredded cheese (more or less as you prefer). Wrap each pan with two layers of foil. Wrap each pan with a few layers of plastic wrap. Set the desired pans in the refrigerator 24 hours before you’d like to serve them. Remove plastic wrap and one layer of foil. Leave a tented foil layer on top of your pan. Place the big deep dish pan on the middle oven rack in preheated oven for up to 2 hours or until heated through and hot and bubbly. Check on your deep dish about an hour into the cooking time. Remove the foil tented layer about 30-minutes before cooking time is complete. For the smaller 9 x13 pans follow the same directions, however, cooking time total should come in no more than an hour. 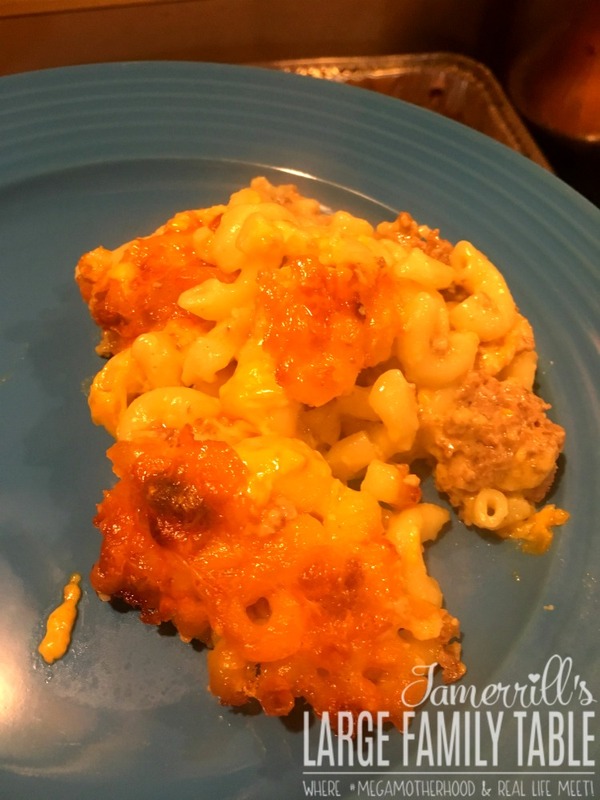 This Macaroni and Cheese Freezer Meal was part of my FREEZER MEALS FOR DAYZZZZZ! Bulk Cooking for a Large Family post and YouTube video if you’d like to see it made in action! 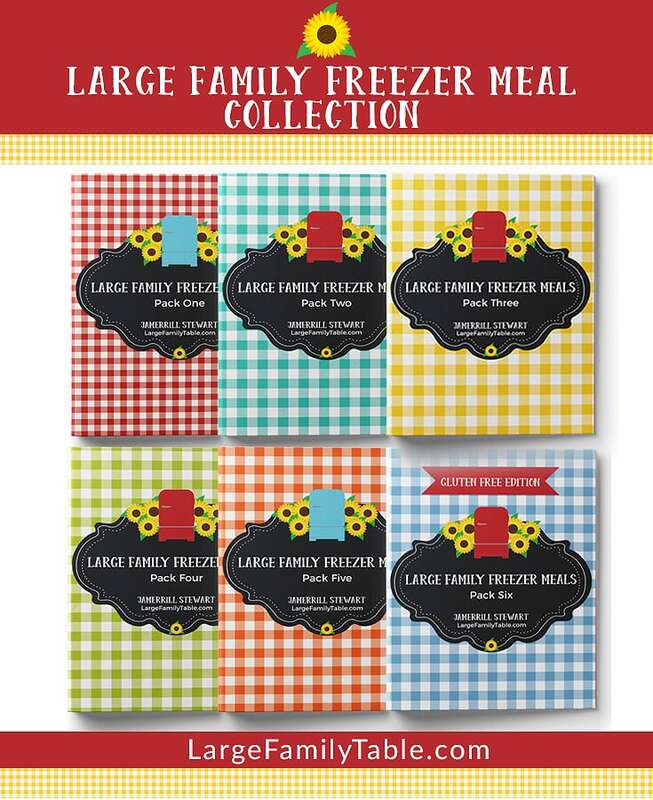 Here are a few more large family freezer meals you might enjoy! 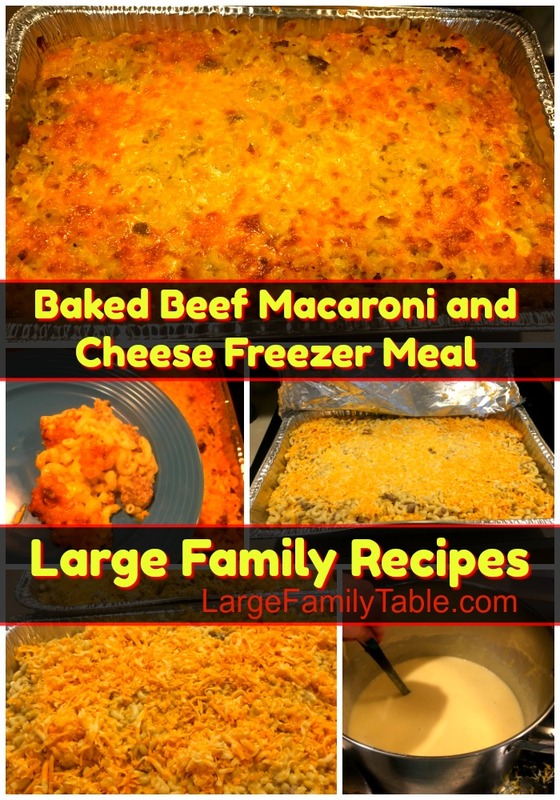 Click here for many more freezer meals for a big family!